“The thing I like best about my community is that we don’t have to buy anything in terms of food, we only eat what we can produce ourselves” says 53 year old Mae Bratoom Tanakhoon, a villager of Kudhin village in the Northeast (Isaan) region of Thailand. Although this degree of self-sufficiency is probably a hard concept for most Westerners to grasp, after visiting Mae Bratoom Tanakhoon’s (Maetoom for short) farm, self-sufficiency doesn’t seem so difficult. On this Wednesday afternoon that I am profiling Maetoom, possible food sources are everywhere. Chickens ranging in color from deep black to off white meander the grounds, sour green mangos that can be cut up to make a salad sprinkle Maetoom’s yard, and (to many Westerners horror) red ants will not only come and bite you, they actually supply eggs for a popular Isaan dish. And these are just the food sources obvious to the eye. Maetoom grows and harvests rice, green onions, garlic, beans, cucumber, lemon grass, coriander, local papaya, plums, mangos, and pumpkin. But, this doesn’t mean that Maetoom’s diet can’t get a little monotonous. During the month of February when I stayed with Maetoom for four days, her diet consisted mainly of stir-fried Fak Tong (pumpkin) leaves, one of the only things growing in her garden during the dry season. Maetoom could have a more exciting, diverse diet, but this would mean sacrificing the values of self-sufficiency she holds dear. Many in Maetoom’s village of about 200 families have compromised these morals in order to have a more diverse diet (among other things); switching to chemical farming starting in the 1970’s. But Maetoom’s family has almost always been organic, and in 1994 the government organically certified her farm. Mae started organic farming with her family after she finished 4th grade, on the same plot of land she farms and lives on now. “When I was 17 I tried using chemicals because everyone else was using them, I thought they were good. We got the chemicals from the district and started using them. But, after one month they had hardened the soil so much that I decided to stop” she says. 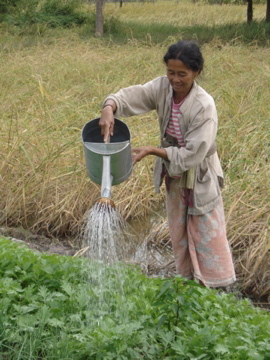 Maetoom’s story is unique in its resistance to the lures of chemical agriculture, as not all the families in her village have been as invulnerable. 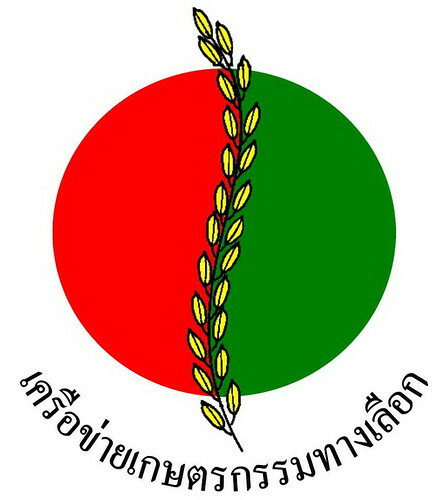 As part of the green revolution, the Thai government pushed chemical fertilizer in Kudhin village starting in 1978. Along with promoting fertilizer, the Thai government also changed the face of one of Kudhin’s main crops: rice. Before 1978, there were over 60 varieties of rice; every family had their own variety, which would harvest at different points during the year. The government pushed only two types of rice- sticky rice and Jasmine105, which ripen at the same time. This inevitably changed and hardened the soil, and villagers had to pay for chemical input to make the soil suitable for growth. As a result, chemical agriculture has put many farmers in Kudhin into debt. Still, many farmers in Maetoom’s village continue to use chemicals, justifying their debt by the beauty it brings to their crops. “My neighbor’s next door use chemical fertilizer,” Maetoom says, “I tell them ‘it’s bad for your health’, but they reply ‘it makes our crops so beautiful!’ I am worried that if it rains the run off of chemicals from their field will come in to mine, I try to block the water from flowing in”. Contamination of her crops by chemical fertilizer is not the only thing troubling Maetoom; thoughts of her two daughters in Bangkok are never far from her mind. Maetoom and her husband, Suwit, had to watch both their daughters leave for the big city after they finished 12th grade. Maetoom and her husband are not alone in their absence of children. Kudhin is basically a ghost town for ages 18-40; most farmers are 45 years or older. Maetoom and her husband are over 30,000 baht in debt because they funded their daughters’ education, yet they hope their daughters will someday give up this education and lifestyle to come back to the farm. Most farmers in Kudhin cite their children’s education as one of the leading causes of their debt. This seems to create an interesting paradox for most farmers; on the one hand they want to support their children’s aspirations and desire to move to the city, on the other hand they would like to see their children come back and take over the farm. The farmers in Kudhin are worried that if their children don’t come back, they will be the “last generation” of farmers. Maetoom and her husband clearly come from a different generation than children these days who run off into the city; they came from a time when farming was the only option. Suwit, Maetoom’s husband, also comes from a farming family in Kudhin village. Maetoom says of their meeting; “we met when we were riding buffalos together. I was sitting under the shade and he came to talk to me. It was easier to know people in those days because there were no fences, you could just come over and say hi whenever you wanted”. While yearning for the days of fence-free living, and completely organic agriculture, Maetoom looks to the future; adjusting to the changing times. Becoming part of the Green Market is one of those adjustments. Before chemical agriculture, Maetoom’s family could get by just living off the land, selling some rice to the rice mill. But now, to deal with the debt from her children’s education, Maetoom needs a little supplemental income. This is where the Green Market comes in. The Green Market is an all organic market in the city of Yasothon, and was started through collaboration with farmers in Yasothon, the government, and the AAN (Alternative Agriculture Network). Maetoom and her husband have been with the Green Market since it started. Farmers in Maetoom’s village drive about an hour into the city every Saturday to sell organic produce to city consumers. Although this requires Maetoom to wake up at 1 am the night before the market (Mae prepares most of her produce in the dead of night), the 700-800 baht Mae makes every week is worth it. “On a good week I can even get around 1200 baht- one of the things I like most about farming is when I make good money for my produce” says Maetoom. This market benefits the consumers as well as producers- organic produce is the same price as non-organic, but Maetoom and her fellow vendors give much higher quantities.